Courtney Baker-Richardson was among the worst culprits as Brakes wasted several chances against Mickleover. A few days and a Birmingham Senior Cup win have mellowed Leamington manager Paul Holleran. Holleran questioned his side’s application in the immediate aftermath of Saturday’s FA Trophy exit at the hands of Northern Premier League Premier Division side Mickleover Sports. However, he was much more circumspect when appraising the Trophy display on Wednesday. “The performance (against Mickleover) wasn’t a million miles away,” said Holleran. “It was just hard to take on the back of (the FA Cup defeat) at Highgate and at home to a team you would expect to beat. “We had enough chances. It wasn’t like Highgate where we didn’t turn up. We did turn up but we didn’t take our chances and we didn’t put pressure on. Brakes were facing another cup exit in midweek when a much-changed side found themselves 2-1 down at Bedworth. However, they responded well to win 3-2 and set up a home tie with Nuneaton on November 15. 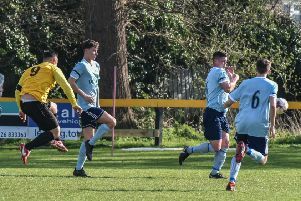 “Several players who have found themselves on the fringes - Callum Gittings, Tom James, Ryan Quinn, Joe Magunda and Nathan Olukanmi - came in and were at it and it was important for the players not playing to see that. Brakes return to league action tomorrow with a home fixture against Basingstoke. The Dragons currently trail Leamington by 15 points but Holleran is refusing to rule them out of the title race. “I tipped Basingstoke to go close at the start of the season but I said they would take a while to settle. “It’s a new structure, a full-time structure but they’ve got some quality players and will feel that if they are there or thereabouts in the new year then they will be able to go on and do something.